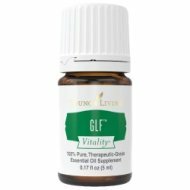 GLF Vitality Essential Oil a wonderful blend of essential oils that have cleansing properties that supports healthy gallbladder and liver function*. I often take in combination with Juva Cleanse or Juva Cleanse Vitality and JuvaFlex and JuvaFlex Vitality complementary oils so click on the link to read more. This is an easy reference guide for GLF Vitality Oil Blend. It will tell you how to use your oil blend and what to use it for. It will also provide you with some fun tips and testimonials! Want to Purchase Therapeutic GLF Vitality Essential Oil? What is in GLF Vitality? Want to Learn about GLF's Emotional, Spiritual and Other Aspects? Then, go to GLF oil to see information on this! Place in favorite smoothie or drink recipe.